You may not have heard of Rhin-O-Tuff, a brand of Performance Design LLC, though their products are sold worldwide. But if your company uses binders for presentations, proposals and documents, the local printer you take your media to likely is using Rhin-O-Tuff punch and binding machines. ​Here’s a little history on this Boise, Idaho-based company. More than 2 decades ago, in 1994, Marvin Whiteman, former owner of Whiteman Industries was approached to design a part for a tabletop paper punch machine. Marvin and his team had a history and passion for building tough high performance products. They had designed and built racecars and motorcycles. Marvin and his team felt they could invent a better, more flexible and efficient family of paper punches. So together they started Performance Design, Inc. and built their first tabletop punch with interchangeable dies called the Versa Punch. ​Soon thereafter they realized customers wanted more flexibility to add modules to decrease the time it took them to punch and stack documents, and modules to address the binding of documents with plastic coil, double loop wire or comb. ​So the concept modular tabletop punches and binding solutions was born. 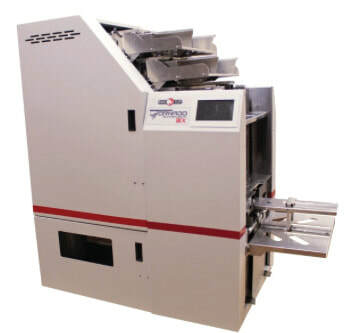 They designed and manufactured paper punches and finishing equipment that could be configured in a variety of ways to solve a wide range of document punching and binding challenges. The new modular designed products were branded Rhin-O-Tuff. Today Rhin-O-Tuff offers a full range of paper punching and document binding systems. The Rhin-O-Tuff brand of equipment is known for high quality and unsurpassed durability by thousands of commercial and corporate users. Whether the need is to increase productivity in a copy center, bindery, digital printing environment, or to add the convenience of doing binding “in-house” for a corporate office, Rhin-O-Tuff has the binding, document finishing, or document handling solution to handle all your demands, and their products are sold around the world through a network of authorized dealers and distributor partners. Their US-based clients most often utilize plastic coil binding, and twin loop binding in more often used in their products designed for Europe. Rhin-O-Tuff systems come with a 3-year warranty and they are environmentally friendly at 98% recyclable. All Rhin-O-Tuff machines are designed and manufactured at their headquarters in Boise, Idaho, and the company has been awarded patents for their innovative designs. The company’s machine shop is equipped with several vertical mills and one large horizontal mill. ​Rhin-O-Tuff was that the Mitsubishi EDM was less expensive than any of the other manufacturer’s offerings. Prior to the purchase, the team from Rhin-O-Tuff visited Mitsubishi’s Regional Sales and Support Center in Long Beach, California. In California, the team learned that Mitsubishi provides preventative maintenance, laser calibration, application support, and even remote monitoring for its customers. Rhin-O-Tuff purchased their Mitsubishi MV1200S EDM in late 2015 from Smith Machinery, who carries a number of fine machine tool lines, including the Mitsubishi line. Smith Machinery has been the distributor of a variety of advanced manufacturing technologies for more than 5 decades. Today, David Soares, (pictured above in the center, at the Mitsubishi Corporate Center), supports many of Smith Machinery’s customers, including Rhin-O-Tuff. He says, “At Smith Machinery, we support manufacturers and job shops in Utah, Idaho, Montana and Wyoming. In our Salt Lake City showroom we stock a variety of these technologies and can provide custom demonstrations, test cuts, process development, training classes and turnkey projects.” David says that the MV series, introduced to the market about 5 years ago, reduces power consumption and use of consumable parts to cut running cost by as much as 42% over Mitsubishi Electric’s older FA series.